The Robertson Valley is a treasure of the Western Cape. 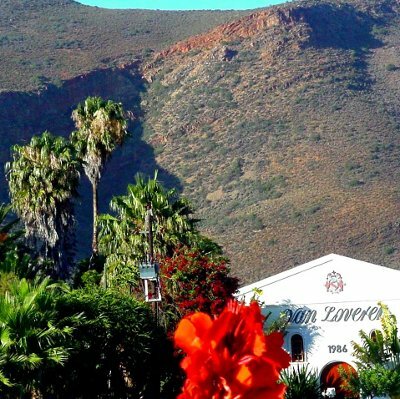 An easy hour and a half drive from Cape Town it forms part of the world's longest wine route, Route 62, which runs from Cape Town to Port Elizabeth. Known as the valley of wine and roses, or the small town with a big heart, the town of Robertson and the surrounding valley offer no-nonsense, genuine hospitality in a setting of vineyards and deciduous fruit orchards with paddocks of frolicking race horses. The Breede river and the Langeberg mountains that dominate this valley offer a spectacular backdrop to a range of activities. The town itself boasts many charming examples of Victorian and Georgian architecture, complete with the British colonial influence of 'broekie lace' cast iron decoration, set against vibrant purple jacarandas and fuchsia bougainvillea. Wine Tasting: This is probably the most obvious activity in the area but it is something that Robertson does particularly well. Much less chichi than Stellenbosch or Franschhoek, Robertson wineries tend to be unpretentious and open. Don't feel you have to know anything about wine (other than that you enjoy it!) to go and have a gander, talk to the winemakers, have a look around the cellars and enjoy the stunning views of the vineyards. Ask questions, you'll find the staff are very well informed. The new tasting centre at Van Loveren is not to be missed, nor the Chardonnays from Springfield and De Wetshof and the tasting experience of Cape 'champagne' (Methode Cap Classique) at Graham Beck - Obama drank the Brut NV at his inauguration ball - is a delight. Go to Excelsior to blend and bottle your 'own creation' wine or have a look at the champion racehorses while enjoying the famous shiraz at Zandvleit. Most places don't charge for tastings and are generally open every day except Sunday. You can either 'free range' and go where the mood takes you (few places require bookings outside festival times) or the Robertson Wine Valley website is helpful at pointing you in the right direction in terms of showing you what's available. Obviously it's not a good plan to drink and drive so make a plan to have a designated sober driver. 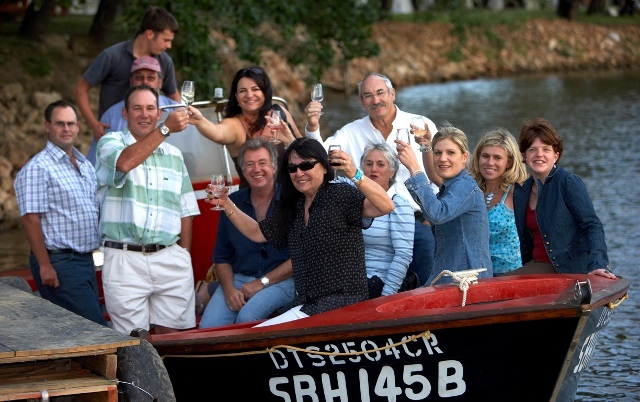 River Cruises: The river cruise at Viljoensdrift can either be part of your wine tasting tour or a destination in its own right. It's a real joy to gently cruise down the river and drink in the views of the surrounding vineyards. The deli has a range of delicacies, like ostrich carpaccio and smoked olive tapenade, for you to choose from to put together a gourmet picnic to enjoy on your cruise. Booking is essential and make sure you get there half an hour before your cruise to choose your picnic. Here is a map from Excelsior Manor Guesthouse to the river cruise at Viljoensdrift (it's easy to adapt if you're staying elsewhere). Olive Tastings and Tours: Although it's not advertised on their website, you can go to Olyfberg and do an olive oil tasting (Tuesdays - Thursday, call to make a booking). It's seriously good olive oil, awarded top honours by L’Extravergine 2008 out of 3,500 oils from around the world. If you're in the area in season (March - August) you can go to the farm and see the picking in action. Donkey Sanctuary: The Robertson area is better known for its racehorse stud farming but children might enjoy a visit to Eseltjiesrus Donkey Sanctuary where old, abused or unwanted donkeys are given a second chance and a permanent refuge in a natural environment. It's a real labour of love. Sky Diving: To see Robertson from a whole new perspective try sky diving! Robertson has become the home of sky diving in the Western Cape since the relocation of the Western Province Sport Parachute Club. The little airstrip on the edge of town is packed with experienced enthusiasts and professionals keen to share the joy of total freedom. It doesn't matter if you've never jumped before, they're keen to initiate first time jumpers and guide learners. Skydive Robertson is open every weekend but, subject to a minimum booking, will also open during the week for you. This map shows the way to the Robertson airport from Excelsior Manor Guesthouse (or you can adjust it if you're staying somewhere else). Spa: To help you unwind there is the Rosendal Spa which offers a range of treatments using TheraVine products, derived from wine grapes and infused with fynbos and herbal extracts. During the summer months there's the option to have treatments outside and, as well as an extensive individual treatment menu, they offer fabulously indulgent 'all day' package to really take time out and pamper yourself. Farming: If you've always fancied the lifestyle of a farmer but don't want to go the whole hog, then a working holiday with Farmer Red Beard will be just up your street. The farm is a traditional fruit and wine farm, typical of the area, and guests are invited to get involved harvesting fruit, making preserves and wine, and bee keeping. There are also good local hikes (not for the faint hearted!) and mountain biking trails. Cactus Gardens: Keen gardeners and botanists will enjoy the Sheilam cacti and succulent garden, named after the initials of the founders six children. It is home to around 2,000 species of cacti, succulents and cycads and is regarded as one of the best collections of specimen plants in the world. A guided tour will take about an hour and half and cost R75 per person. Hiking: The Robertson wine lands are crisscrossed by hiking trails in the surrounding mountains. It's hard work but the stunning views across the valley are really worth the effort, as are the bird and plant life. Remember that Cape weather can be very changeable and it's not that abnormal to experience a bit of all four seasons in one day so pack properly. One of the most accessible trails, the Fish Eagle Hike, starts at Van Loveren and is well signed and maintained. There's also a chance to see a relatively rare Fish Eagle. There's a 2-day hike called where you sleep over in a stone hut just below the summit of Arangieskop. Micro Brewery Tour: If you've had enough of wine tasting you might enjoy a visit to the Saggy Stone micro brewery. It's the brain child of the RobINson brothers who set out to create farm brewed beer using barley, hops and pure mountain spring water from the head spring at the top of Langeberg mountains. Tours can be arranged by appointment. Golf: The new 18-hole course at the Silwerstrand Golf and River estate is a kilometre outside Robertson and for anyone keen on golf it's well worth playing a round there. Immaculately maintained and with the ubiquitous backdrop of the Langeberg mountains and the vineyards, the course is described as 'golfer friendly' with easy walks from tee to green. There's also a modern club house and a pro shop. This map shows you how to get to Silwerstrand Golf course from Excelsior Manor Guesthouse (or you can adjust to wherever you're leaving from). Horse Riding: Throughout the valley you'll see numerous horses dotted around at the various stud farms and liveries. An outride through the vineyards and along the banks of the Breede river is an adventure experience not to be missed. Because you're higher up you see so much more than you would on foot and naturally you can cover a lot more distance 'off road'. Don't worry though, there's no chance you'll be riding a racehorse! Robertson Riding School provides guided outrides and lessons, and sensitively caters to all levels. Beginners and experienced riders are welcome. Wine tours on horseback can also be arranged. Quad biking: To explore the many trails off road without having to put on your hiking boots you could go quad biking. Tradouw Quads cater for children as well as adults and have a range of hand built trails across the Langeberg Mountains and the Little Karroo. You can either bring your own quad bike or use one of theirs. You don't have to have any previous experience with quad bikes - they have lots! 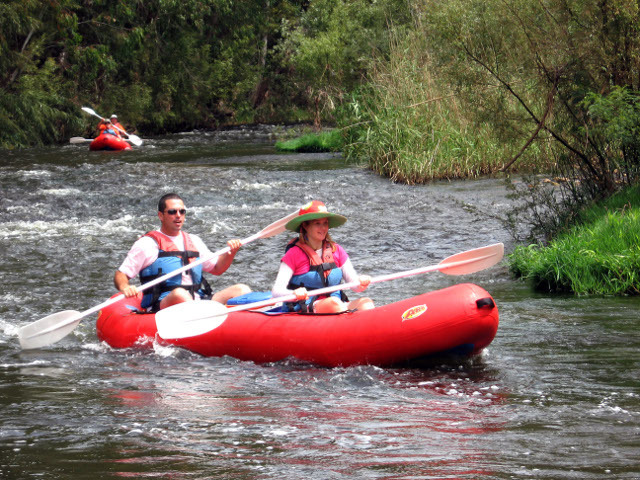 River Rafting: One of the best ways to experience the peace and tranquillity of the Robertson valley is to paddle down the Breede river. Rafting Route 62 offers a 10km trip, led by an African Paddling Association guide, during which you'll take in views of the vineyards and spot the local wildlife. First timers need not fret as the river is gentle but there are a few small rapids which get the heart racing. 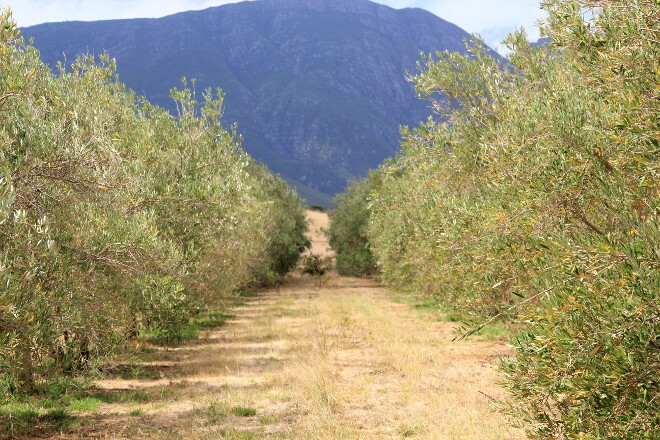 News : May to August 2013: The Robertson Small Hotel launches a Savoury Safari, which includes vising an olive factory, wine tasting & cellar tours. Step 1 : Book a flight to Cape Town or to George. Here is a map showing the way from Cape Town to Robertson. It assumes you're staying at Excelsior Manor Guesthouse but is easy to adjust if you're staying elsewhere. So after you land, hire a car at Cape Town Airport and follow these directions. Excelsior Manor Guesthouse is an old fashioned ostrich palace and former family home of the de Wet family who have farmed Excelsior for the last five generations. Built in 1914, but recently lovingly restored to its former glory, it oozes old world charm, comfort and grace. 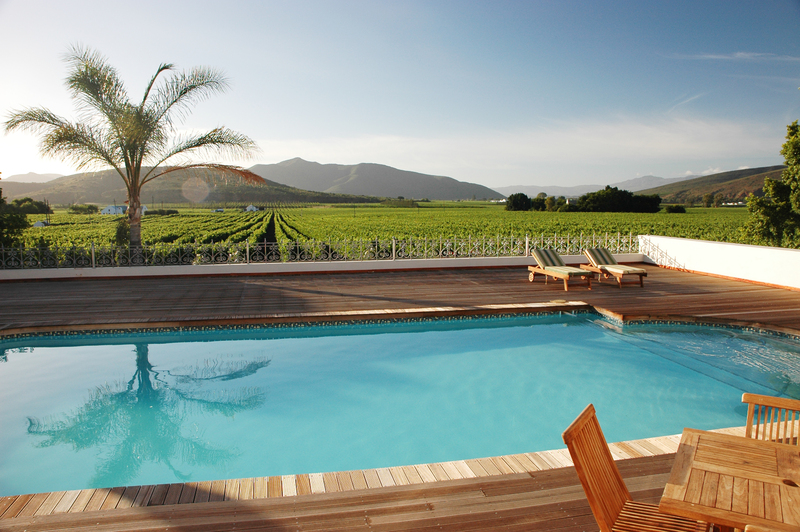 Set in lush, mature gardens with panoramic views of the vineyards and the distant Langeberg mountains, this is a haven of relaxation far from the madding crowd. The Robertson Small Hotel is in the heart of town and manages to be both quaint and chic; a beautifully maintained Victorian building complete with broekie lace clad verandas and a five star, luxury modern interior. The Wellness Room offers on site head to toe relaxing and rejuvenating treatments and Chef Reuben Riffel's restaurant, Reuben's at The Robertson Small Hotel, is a treat for even the most sophisticated palate. Goudmyn River Chalets are ideal for families or groups who want some privacy and space to run around without disturbing others. Two adjacent fully functioning self catering units, with all the linen and towels supplied, it won't take you long to settle in and enjoy the views. Situated on the Breede River, Rivierzicht has 8 bush tents, 15 camping sites, 2 single bedroom self catering cabins & 2 double bedroom self catering cabins. Route 62, Breede River Valley. 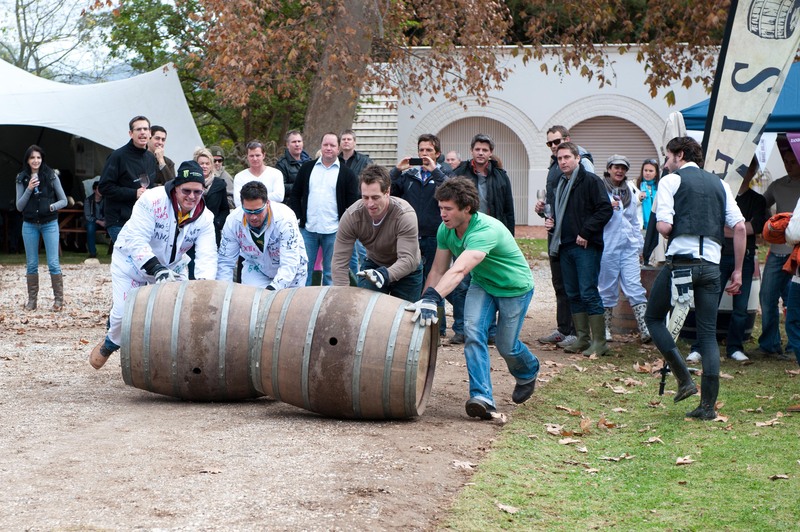 The Hands on Harvest festival is usually in February, and provides a chance for wine lovers to get stuck in to the grape harvest and experience all it entails, without risking their day jobs! Have a look at the website for details of which farm to visit and other activities, like the open air Riana Nel concert at Excelsior Estate and the Grape Escape Amazing Challenge Race. 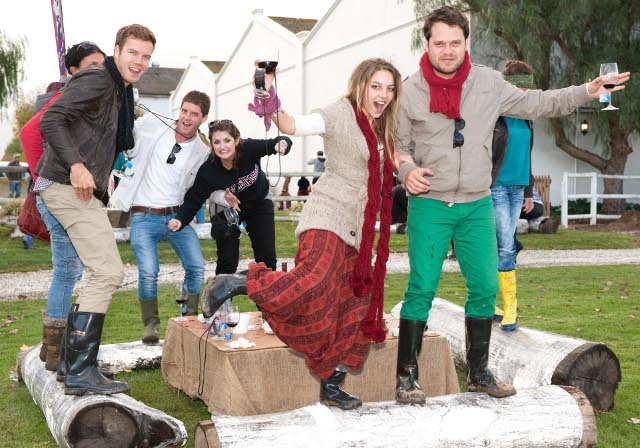 6 - 9 June 2013: The Wacky Wine Weekend is Robertson's most famous festival and thousands of people flock to the area to enjoy a long weekend of wine and merriment. 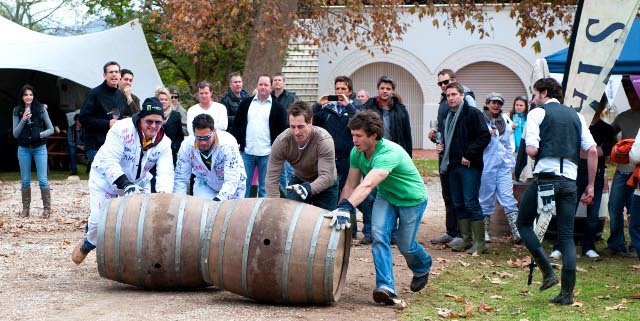 All the major wineries in the area take part and lay on a combination of wine related and family fun activities. There's an extensive programme with lots to offer. 10 - 12 August 2013: The Robertson SLOW Festival is a celebration of food and wine made slowly with love, care and attention. 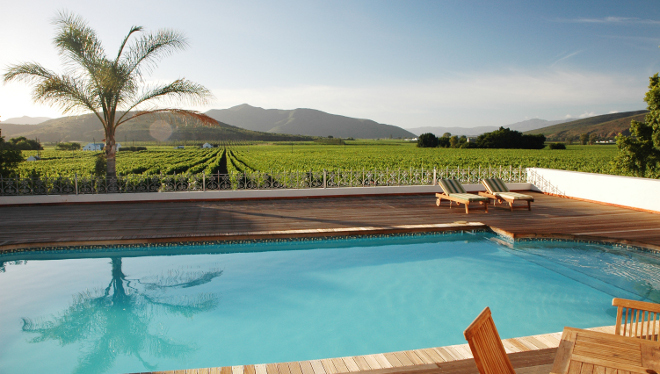 It's an opportunity to completely relax and take things gently as wineries and guesthouses across the valley throw open their doors and invite visitors to sit down and savour traditional Robertson country fare. For details of what's on the menu have a look at the website. 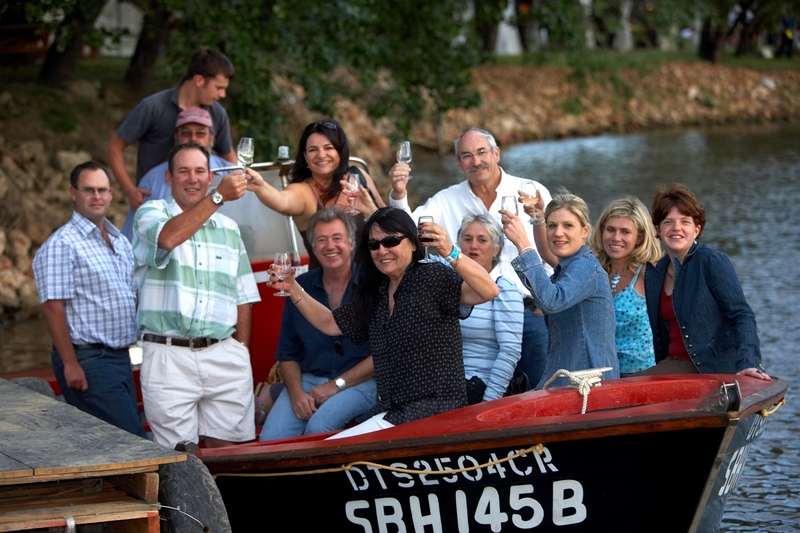 October 2013: Wine on the River is an open air wine festival on the banks of the Breede River. Unlike the other festivals which are spread out over the Robertson valley, the Wine on the River allows you to stay put and sample regional wines while listening to live music, enjoying local produce and watching the river float by. Fraai Uitzicht: Remember that age old question 'what would you eat for your last meal?' You should go to Fraai Uitzicht for dinner; the menu is small and perfectly formed. Susan, the Chef, uses only the best quality, fresh, local ingredients to create her scrumptious dishes. It's gourmet food, beautifully presented but without being fussy. Great service and a well thought through wine menu make for a fantastic dining experience. It's not surprising that it's award winning. It is surprising that it's such good value. This map shows you how to get to dinner at Fraai Uitzicht (including a short journey on untarred road). It's set to leave from Excelsior Manor Guesthouse but as with all the maps, it's easily adjusted. Mo & Rose: Set in a beautiful 'secret' garden of succulent plants and trees, Mo & Rose is its own little serene bubble. The wine bistro is a tastefully converted barn which manages to be at once chic and unpretentious. There is a charming veranda to enjoy a lively lunch or sundowners in the cool evenings. It's a place to take your time and enjoy the celebration of food and wine - 'Tischkultur' - cultured dining with attention to detail and a jolly atmosphere. Reuben's at The Robertson Small Hotel: Established by celebrity chef Reuben Riffel, this restaurant is one of the gems of the Robertson Valley. The eclectic menu leans towards organic food with an emphasis on seasonal produce and a focus on 'local'. It's an innovative restaurant where the menu doesn't stand still but texture, flavour and juiciness are always at the heart of each dish - whatever you choose, you'll enjoy something extra-ordinary.